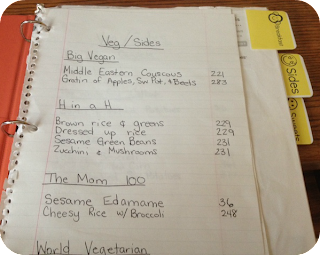 Earthworms and Marmalade: Super Recipe Book Organization! or How To Make Recipe Binders Sound Exciting! Super Recipe Book Organization! 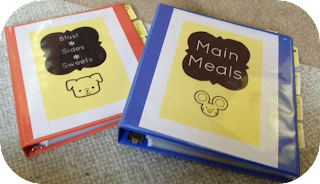 or How To Make Recipe Binders Sound Exciting! In an attempt to get a bit more organized around the house, I've made up some binders for recipes that I like to use. One contains main meals and is separated into sections based on main ingredient. The other has breakfasts, sides, and sweets. In the front of each binder, I made a catalogue of recipes that I like to use from cookbooks on my shelf. This helps me when I'm trying to remember which cookbook has that Black Bean Flauta recipe! Here they are, nothing fancy!